Civil Appeals - Shannin Law Firm, P.A. All trials have winners and losers. Normally, the judge or jury gets it right, but sometimes an error occurs, and the trial results need to be appealed, thus creating grounds for appeal in civil cases. 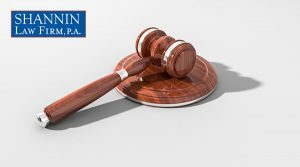 As one of the best appellate law firms, the Shannin Law Firm represents clients and assists lawyers from other law firms in appeals throughout Florida’s state and federal courts, including the U.S. 11th Circuit Court of Appeals all the way up to the United States Supreme Court. Many of these appeals involve large personal injury verdicts. Others involve important issues of law requiring review by an appellate court. Either way, there is something important at stake, and the assistance of a board certified appellate attorney can be essential to giving you the best chance of success on appeal. As one of the top appellate law firms, our civil appeals attorney at the Shannin Law Firm has the knowledge and experience to assist in all matters pertaining to appellate law. Trial attorneys: Don’t wait until after a final judgment has been entered to obtain appellate co-counsel. Help with a Motion for New Trial or other post-verdict motions can be essential to either preserving errors or defending a verdict on appeal. Contact the Shannin Law Firm as early as possible to discuss your litigation to find out if bringing in appellate co-counsel can benefit your case.